Korth USA, the American side of the German luxury handgun manufacturer Korth-Waffen, had exactly one new product to show off at this Shooting Hunting Outdoor Trade Show’s Industry Day at the Range, the Sky Marshal. 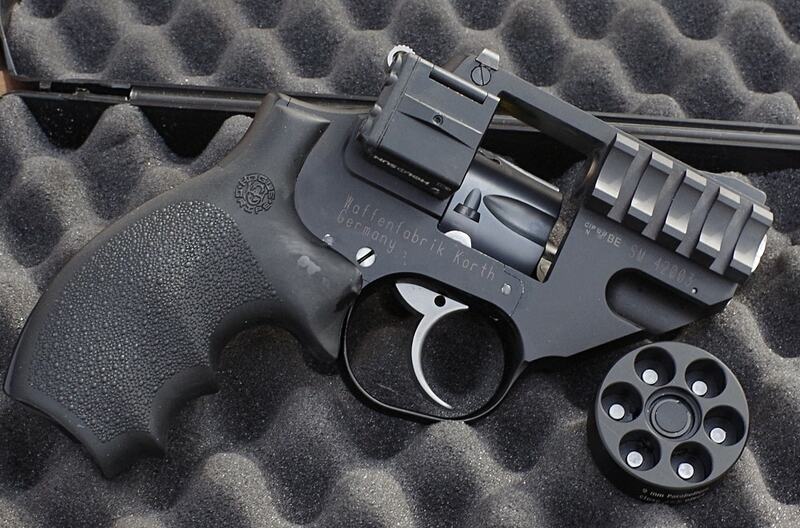 A big departure from the high-polish pistols and revolvers the company has built their reputation on, the Sky Marshal is a compact service revolver chambered for 9mm Luger. While it’s more expensive than many common revolvers on the American market, the Sky Marshall is far more affordable than other Korth firearms that can cost upwards of $6,000 with a street price expected to hang around $900. This is one Korth that people can hope to own one day. And with good reason — the Sky Marshal is a great little handgun. Unlike the bulk of 9mm revolvers, the Sky Marshal has no need for moon clips. Cartridges drop freely into the cylinder and index on the case mouth as they would with any standard semi-automatic pistol. They eject just like rimmed cases, too. Pressing on the ejector rod causes six extractors to swing out and lock into the grooves of the spent ammo before lifting them out all at once. It just works. The Sky Marshal is lightweight and comes with a 2-inch barrel, standard. It has an aluminum alloy frame and optional rails on the side for weapon lights and laser sights. Unlike many concealed-carry revolvers it has a full-sized grip which makes the gun easy to handle and shoot even with hotter 9mm loads. Korth designed the whole pistol around the cartridge. The cylinder is just long enough for the rounds, they didn’t just re-chamber a .38 Special or .357 Magnum cylinder for the Sky Marshal. This shortens the gap between the bullet and the forcing cone, ensuring better accuracy and less bullet deformation. The trigger of the models we had the chance to shoot at this year’s SHOT Show Industry Day at the Range were excellent, too. The Korth pedigree is intact with the Sky Marshal double-action trigger at about 9 pounds and the single-action trigger at around 3. We will meet with Korth to get more details about this new service revolver including availability and more technical specifications this SHOT Show. Check out our coverage of SHOT and stay tuned for more throughout the week.